I bought a package of farmer cheese for Passover because I like to make a matzo-cheese-leek pie. Farmer cheese is kind of like a smooth and dry cottage cheese, a little like feta cheese but not as crumbly and with a less tart taste. Unfortunately, I forgot that my recipe called for half a pound of farmer cheese, and I bought the larger, one-pound package. After Passover, I had to figure out what to do with the rest of the farmer cheese, so I took a look at what was in my fridge and came up with this recipe. If you don’t have farmer cheese, you can substitute small-curd cottage cheese (drain it before adding to the rest of the ingredients) or finely crumbled feta cheese. I had leftover rice so I used a little of that to add starch and thickening, in place of the flour I would normally use. Don’t make rice just for this recipe; use flour instead. Heat half the butter or oil in a medium skillet and saute the onions and peppers until soft. Add the chopped tomato and spinach, and continue cooking until any liquid is evaporated. Set aside. Put the remaining butter or oil in an 8-inch square baking dish (or use a glass pie plate) and put it in the oven for a few minutes until the butter melts or the oil is heated. Beat the eggs and add in the farmer cheese and cubed cheese, then the cooked and cooled vegetables, rice or flour, and spices. Mix well. Pour the melted butter or hot oil into the mixture, and then put everything into the greased baking dish or pie plate. Bake for about 40 minutes or until firm and slightly browned. Fresh corn is everywhere these days, from farmers’ markets to your local supermarket. In many states, including Michigan, it’s local produce — fresh and delicious — and a great buy at this time of year. Here’s a good recipe for fresh corn if you want to do something besides eat it off the cob (which, honestly, I think is the best possible thing you can do with fresh corn). Save the recipe to use again when corn season is over; it’s also fine with frozen corn. Serve it as a main dish with a nice salad for a luncheon or light supper, or as a side dish with grilled fish or (if you’re not a kosher-keeper) chicken. Puree 1 cup corn with melted butter and eggs in a blender or food processor, or use an immersion blender. Mix the remaining ingredients in a bowl. Add the pureed mixture and blend well. Pour into casserole and bake, uncovered, for 50 to 60 minutes until puffed and golden. 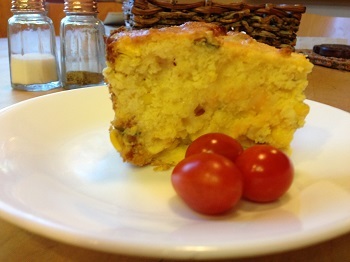 Another winning recipe from my friend Greta Zalman! The recipe calls for starting with fresh salmon, which you poach, but I find it works best for me as a way to use leftover salmon. It doesn’t have to be poached — baked salmon works fine, even if it has a glaze on it, as long as the glaze isn’t too overpowering. If you start with cooked salmon, just ignore the first line of the directions, but cut the leftover salmon into 1-inch chunks. When I made this recently I didn’t have any scallion so I substituted 1/3 cup finely chopped onion. This makes a very nice brunch dish. If you are serving a large crowd or bringing it to a large potluck, you can double the amounts and bake it in an 8 x 13-inch baking dish. Bring ½ cup of water to boil in a medium skillet. Add the salmon, reduce the heat and cover. Cook until the salmon is almost cooked through – about 3 to 4 minutes. Discard the poaching broth. In a large bowl, stir together the flour, dill, salt and pepper. Whisk in the eggs, 2 at a time, and then the mustard and the milk. Stir in the scallions and parsley and all but 2 Tbs. of the cheese. Stir in the poached salmon cubes. 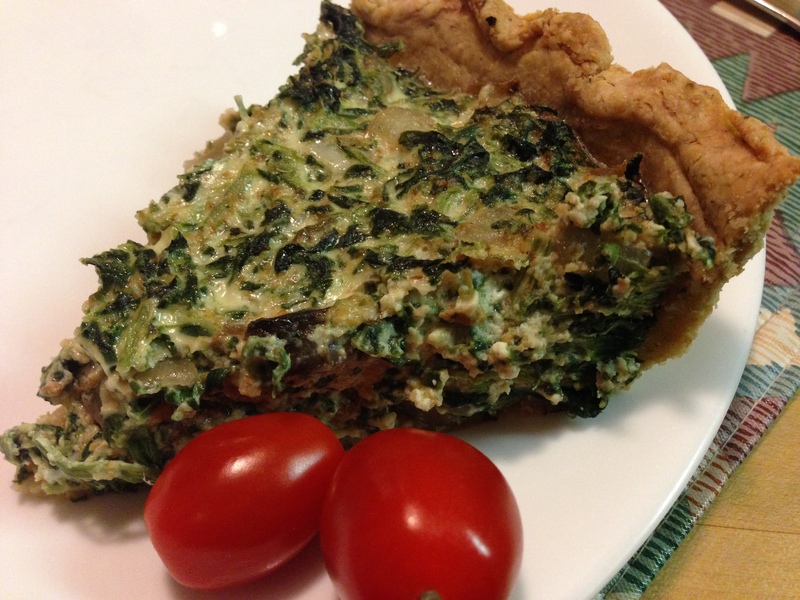 Lightly spray a 9-inch glass pie pan or porcelain quiche pan with vegetable cooking spray or lightly brush with oil. Pour in the mixture; make sure the salmon is distributed evenly. Sprinkle the top with paprika and the reserved 2 Tbs. cheese. Bake for 45 minutes until puffed and set. Cool for 15 minutes before serving. Cut into wedges and serve hot with lemon wedges on the side. I haven’t made this in awhile so I don’t have a photo. This one is by Andra Cristescu, via Flickr Creative Commons. Here’s a great dairy recipe just in time for Shavuot. This dates back to my days in the communications department at Sinai Hospital of Detroit, where the cafeteria regularly served a white, not red, “vegetarian lasagna.” I suspect it was Stouffer’s frozen version, but it was pretty good. So when I found this recipe, I can’t remember where, I was sure to save it. It’s a bit of a patchke to make, but it’s delicious and makes a good “company” or potluck dish. You can prepare it ahead of time and keep it covered in the fridge until you’re ready to bake it. If you do that, bring it to room temperature before baking. A lot of people make lasagna these days without boiling the noodles. I haven’t tried it with this recipe, but using uncooked noodles should be no problem. Make the cheese sauce: In a medium saucepan, melt the butter; blend in the flour. Gradually add 2½ cups milk and cook over medium heat, stirring constantly, until sauce boils and thickens. Add 2 cups of cheese and cook until mixture is smooth. Stir in the mustard, hot pepper sauce and salt. Set aside. Make the filling: In a large saucepan, heat the oil and sauté the mushrooms, onions and garlic until tender. Tear the spinach into bite-sized pieces. Add the spinach and carrots to the saucepan and cook 2 to 3 minutes, until the spinach is tender. Drain the vegetables. 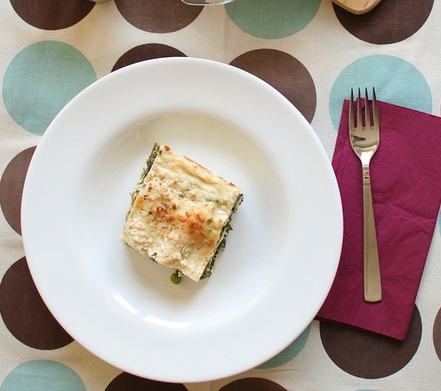 Stir in 1½ cups of the cheese sauce into the spinach mixture. Add ¼ cup milk to the cheese sauce remaining in the pan. Assemble the lasagna: Grease a 9 x 13-inch baking dish. Pour half the cheese sauce into the dish. Arrange 3 lasagna noodles in the dish over the sauce. Spread half the spinach mixture over the noodles. Repeat the layers. Spoon the remaining sauce over the noodles and sprinkle the remaining ¼ cup cheese over the top. Bake about 25 minutes. Let stand 10 to 15 minutes before serving. I clipped this recipe from Cooking Light. It wasn’t meant to be vegetarian, but first of all, it’s hard to find kosher Italian sausage, and secondly, I preferred to make it veggie. Just know that the original recipe called for meat sausage. You could also use soy crumbles instead of veggie sausages, but the taste would be different; the Italian sausage has unique spices. The original recipe called for instant polenta and plain yogurt, neither of which I had on hand, so I looked up another recipe. Polenta is really bland, so I added a cup of shredded Parmesan cheese, making the entire dish dairy. When you serve the polenta straight from the stovetop, it will be creamy. If you have leftovers, put them in a flat-bottomed container. The polenta will harden. To reuse, you can cut it into slices and fry them up in a little olive oil or butter, or bake them in the oven topped with a sauce (or leftover ragout). The Cooking Light recipe said it serves 4, but the two of us ate large servings and there was still enough left over for 4 more, so I’m saying it serves 6! Heat a large skillet over medium-high heat. If you use real sausage, crumble it in the pan and cook for until browned; remove from pan. Add oil to pain, then saute onions for 3 minutes. Add tomato paste and garlic; cook 1 minute, stirring frequently. Add wine, cook 1 minute, scraping pan to loosen any browned bits. If you use vegetarian sausage, which is pre-cooked, crumble it into the pan now. Stir in the remaining ingredients. Simmer 8 minutes or until slightly thickened. If you browned the sausage at the beginning, add it back in now and heat through. For the polenta, bring the water and salt to a boil in a 2 or 3-quart saucepan. Add the cornmeal gradually, whisking vigorously as you do so no lumps form. Cook for about 10 minutes, whisking frequently. Lower the heat as low as possible and continue to cook for 20 or 30 minutes, stirring every 5 minutes or so. 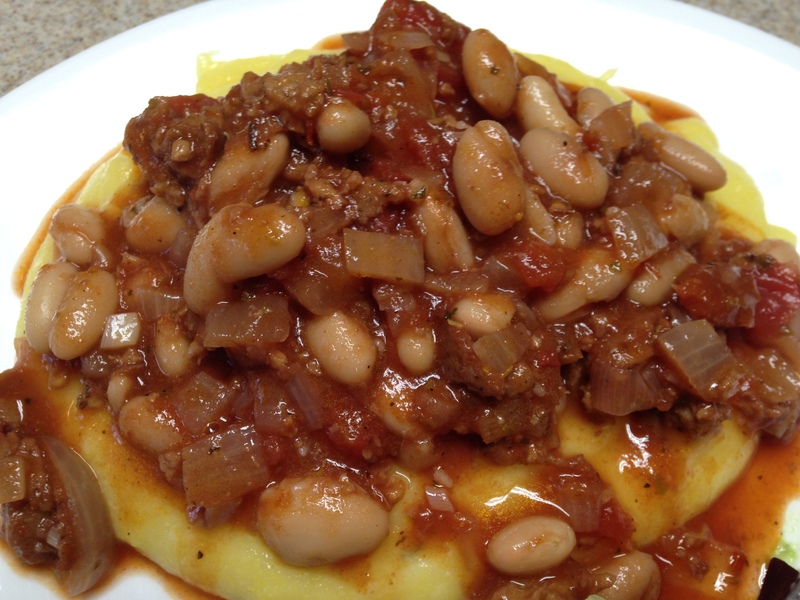 Be sure to scrape the bottom and sides of the pot when you stir, so the polenta doesn’t stick. Whisk in the rosemary, butter, cheese and rosemary (if you use dry rosemary — use 1/2 tsp. — add it when you put the cornmeal into the water). A week or so ago I bought a pint of half & half for another recipe, but I used only half a cup. What to do with the rest? I searched my recipe files for “half & half” and … serendipity! I came up with this recipe, which not only uses the exact amount of half & half I had on hand, it also uses a quarter-pound of mushrooms, which I also had on hand. Of course I didn’t have any wheat germ or block cream cheese (I use whipped cream cheese on bagels) but that didn’t stop me from feeling like I was fated to make this recipe this week. It’s a delicious tart, even if it is a bit of a bother to make. I’ve had the recipe for more than 35 years. I can tell if a recipe is really old if it’s in my card file box. That’s where I first started my recipe collection — which quickly outgrew the box! I clipped it from a newspaper, and the clipping is now very yellowed. The recipe calls for regular, untoasted wheat germ in the filling. All I could find in Kroger was toasted — and who wants two jars of different types of wheat germ anyway? So I used toasted wheat germ in the filling and it was just fine. 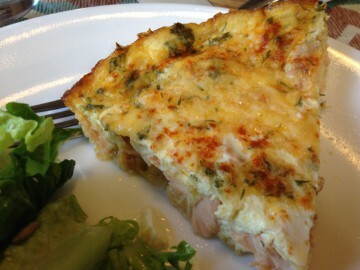 Make wheat germ shell: Mix toasted wheat germ, salt, and marjoram and cut in butter. Stir in the egg yolk or egg and just enough water to get a crumbly mixture that holds together when pressed. Press into a 9-inch pie plate and flute the edges. Make filling: Thaw spinach and squeeze dry. Saute onion and mushrooms in butter. Beat softened cream cheese, gradually adding half & half. Stir in Parmesan cheese, eggs, spinach, wheat germ, tarragon and marjoram. Add the sauteed onion and mushrooms. Turn into the wheat germ shell. Bake 35-40 minutes until filling is set in the center. Cool for 5 to 10 minutes before slicing.